You’ve managed to get out at the crack of dawn and face a peaceful lake with a long day of fishing ahead. The serenity is soothing and the twinkling of the new sun is magical. Without realizing it, the sun beats down with an intensity obscured by the wind and the spray from the water. While sunny days fishing are an enjoyable experience, sunstroke is no joke. Neither is an awful sunburn or early onset of wrinkles. While spending time in the sun can give us a glorious tan and make us feel good while we’re fishing, we need to ensure we’re taking proper precautions from the dangers of the sun. A good fishing hat protects you from the sun, while often being waterproof and serving as extra storage. We’ve put together this guide to help you choose a great protective hat to wear while fishing. Wearing a fishing hat is a great way to protect yourself against sunstroke, sunburn, and windburn. However, some anglers complain that fishing hats obstruct their vision and get in the way. So let’s look at the benefits (and a few of the cons) of wearing a fishing hat. You’ll find that fishing hats are able to shield your head from the sun - something that balding people will find especially important! By wearing a hat and drinking enough fluids, you can effectively avoid sunstroke, as well as reduce the risk of sun and windburn. On colder days, fishing hats also prevent against heat loss in the chilly weather, as most of your body heat is lost through your head. A fishing hat also keeps the tips of the ears warm. Some fishing hats include pockets that enable you to store things in them while fishing, such as hooks and flies. Other hats have clear pockets for you to store licenses and paperwork that you may need to prevent from getting wet. While some fishers say that peaked fishing hats provide sun protection for their eyes, other anglers say that wearing a peaked hat can obscure their vision - one negative aspect of wearing a fishing hat. Equally, peaked fishing hats can easily blow off in the wind if not tight enough. This is another thing to consider. When you’re thinking about a fishing hat, it is imperative to consider the environment you are in. The cold-water fisher may need to look for a wooly hat for warmth, whereas the tropical beach angler may want a quick-dryer in case it flies off on his catamaran! Here are a few things to look for in a good quality fishing hat. Firstly, the size of a hat is important. Of course, you want it to fit your head, but it is important that you have a snug fit. For those who have lost fishing hats with hooks and flies attached to it, they know the sadness that comes from a hat being blown off of falling in the water. In the same manner, a chin strap is another great way to keep your fishing hat from escaping. If your hat isn’t tight, you can always look for models that showcase a chin strap or other methods to help fix it to your head. Chin straps are usually adjustable with a simple push toggle, allowing you to alter it for different levels of comfort and depending on the weather. Some anglers also like to look for waterproof fishing hats just in case it does fall off. That way, with a quick wipe, the hat is nearly dry again. While waterproof hats tend to be a little stiff, the alternative is to invest in a quick-drying fishing hat. If it falls into the water or gets damp, it will dry within 15 minutes in the cool breeze - and be ready to wear again. Fishing with a hat is sometimes a must. Equally, consider waterproof pockets for storing paperwork and licensing you might need for fishing in your spot. Identify fishing hats which have pockets and extra accessories on them. Pockets can be useful for storing smaller items that you need frequently. By popping them in your hat, you don’t need to continuously open and close your tackle box. You should think about the climate you are fishing it. For those in sunny places, you might want a peak or visor to protect your eyes from the sun while providing shade to better see the fish. Moreover, wide brims will help to protect more of your neck and shoulders from sunburn. If you live in a cold climate, you may want to look for furry materials and warm wools. Ear defenders that can cover the tips of the ears will help to prevent heat loss significantly. Still stuck on choosing a hat? We know your pain. With so many fishing hats on the market, it can be bamboozling to choose between them. Luckily for you, we’ve done all the hard work for you, narrowing it down to what we consider the best fishing hats available today. We’ve provided you with a little background, some solid pros and cons, and our expert opinion on each fishing hat, to keep you protected out on the open water. 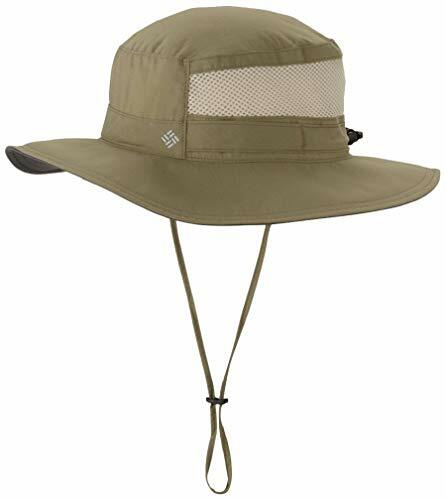 Available in six different colors, this 100% textured nylon poplin fishing hat employs advanced technology to block out 98% of harmful rays from the sun. Featuring ventilation mesh, the hat keeps you cool. The hat also has an adjustable pull cord and toggle and is designed to fit securely. A lightweight summer fishing hat, this well-ventilated hat is designed to reduce sweating, while protecting you from the sun. Though not waterproof and a little on the thin side, this hat comes in a range of colors for you to choose from. Beware that this hat doesn’t have any extra pockets, but does have an adjustable pull cord to help you keep it attached securely to your head. 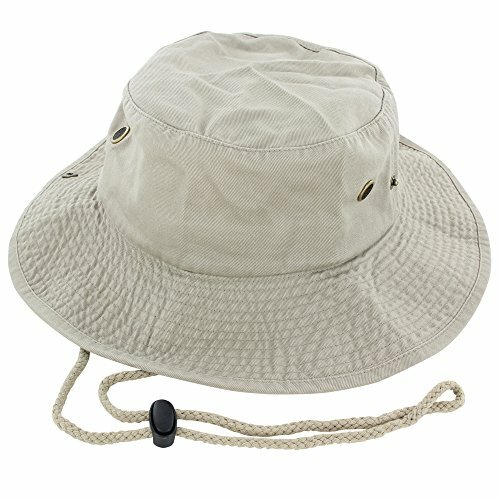 Made of 100% cotton, this fishing hat comes in six different colors. It features an adjustable chin strap, as well as a wide brim and side snaps to pin the edges of the hat up. Small metal-edged holes provide ventilation and the hat is available in seven different sizes. Small Holes for Great Ventilation, Reduces Perspiration. While not waterproof, this durable cotton hat provides plenty of ventilation for warmer weather. The wide brim helps to protect from the sun, while the side snaps enable you to extend your peripheral vision by tucking back the sides of the brim. A great fishing hat, this model comes in six different colors and seven different sizes. Fashioned from 100% high-quality polyester, this waterproof fishing hat comes in seven different colors. Designed for summer wear, this model by LETHMIK comes as ‘one size fits all’ but still features an adjustable chin strap. The hat has a sun protection factor of 50+, protecting from 98% of harmful rays from the sun. It can easily be folded down for storage, while the mesh is embedded in the top of the hat for ventilation. If you’re looking for a waterproof hat, this model has a great mesh design that helps to reduce sweating. There are no pockets on this hat but the adjustable strap and side snaps help to create a comfy fit for the wearer. The hat is designed to protect your head and eyes from the sun and is available in seven colors. This full-face fishing cover is designed to provide the utmost sun protection. 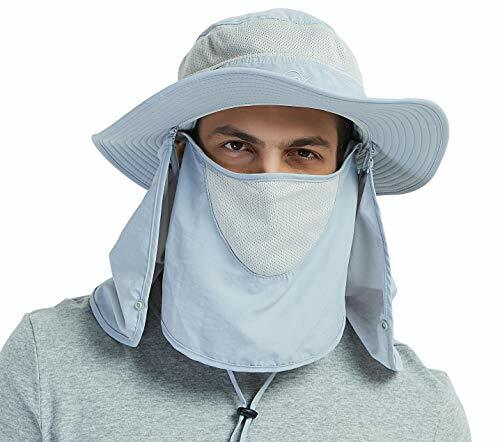 The removable flaps protect the head, face, ears, and neck from sun and wind burn, while the large meshed brass eyelets provide great ventilation. The material protects from 98% of the sun’s rays, while the ‘one size fits all’ hat folds down to a very small size, making it easy to pack away. This excellent all-rounder is a lightweight hat that shields you from the wind and protects from the sun. Protecting your face, ears, neck, and head, this fishing hat is available in five colors and comes with detachable flaps for more versatile styling. Remember that this has quite a tight fit and it only comes in one size, so may not be suitable for people with very large heads. Made from 100% cotton, this soft-to-touch fishing hat comes with an adjustable chin cord. 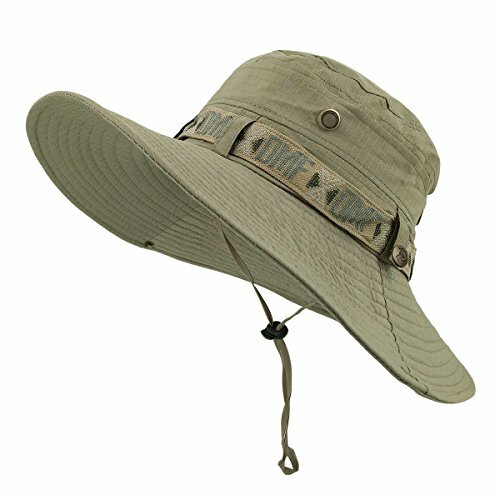 Available in two sizes, this fishing hat comes in a whole range of colors, including various camouflage colors. Designed for summer wear, the vents keep your head from sweating, while the brim serves as an excellent sun shield. Comes is a Whole Range of Appealing Colors. 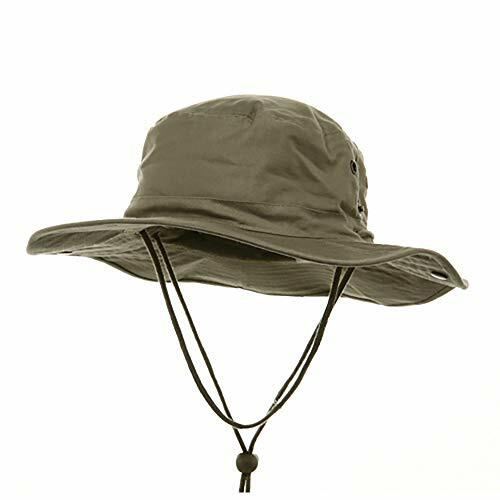 While this fishing hat isn’t waterproof, the thick cotton is extremely durable. The impressive range of colors and traditional summer design are very eye-catching, while the wide brim serves as a great sun shield. The mesh vents and quality cotton provide great ventilation, while the chin strap allows you to adjust the hat to protect against the wind. This comes in two sizes and fits snugly, but the brim is a little floppy. With all that said, you should now have a pretty good idea of what to look for in a fishing hat. Our choices are some of the best we’ve seen out there, and we’re hoping our handy pros and cons of fishing hats will help you to make a sensible choice. Always think about your environment and its climate, while bearing in mind what you’ll be up to and how much you want to spend. Remember that waterproof and quick-drying hats are always extra handy if they happen to fall in!